From supporting the student experience to funding our earth-friendly ethos, the University of Washington is proud to partner with Coca-Cola as we work together for a world of good. Coca-Cola’s mission to inspire moments of optimism and happiness plays an active role in engaging our campus community through events, initiatives and athletics. By thinking globally and acting locally, Coca-Cola supports education, sustainability, wellness, and women. Together, we are committed to serving our collective communities in Washington — and around the world. Our partnership transforms the lives of students and all of the people we serve. As a Career Center Signature Employer, Coca-Cola hires Huskies, offers scholarship support and participates in events like the ASUW Spring Concert, Dawg Daze, Dawg Dash, pre-game UWAA Warm-Ups and W Day. 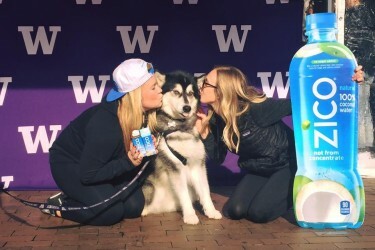 A strong sponsor of the UW’s philanthropic campaign launch event, Coca-Cola also hosts fun campus contests for X Ambassadors, Powerade Just a Kid and Stevens Pass. Together, we’re working to save the planet. It started in 2009, when Coca-Cola partnered with a group of enterprising students on creating compostable cups. 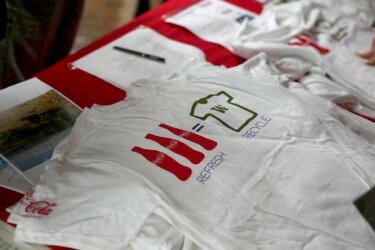 Today, Coca-Cola supports SustainableUW Fest, Earth Week and collaborated with Housing & Food Services on reuseable cups for student meal plans to support the reduction of waste and associated cost on campus. Its commitment to water stewardship and conservation parallels the UW’s research and education efforts. Coca-Cola and the UW take pride in promoting personal health and well-being locally — and globally. The company supports club sports and wellness events at the IMA, including the Northwest FitFest, Intramural Seattle Cup, and UW Recreation; Housing & Food Services offers Coca-Cola products with reduced-, low-, and no-calorie options; and the company is galvanizing global action to combat public health challenges like obesity. We believe in the power of women and creating opportunities for success. Coca-Cola and the UW hosted a college tour for high school students from Adelante Mujeres, an Oregon-based organization helping to empower Latina women. Read about their hopes for the future and what they are doing to live their dreams. Coca-Cola is also working on 5by20, their global initiative to enable the economic empowerment of 5 million women across their value chain by 2020, and is proud to be giving women opportunities to build their business and support their families. while inspiring more to do the same. 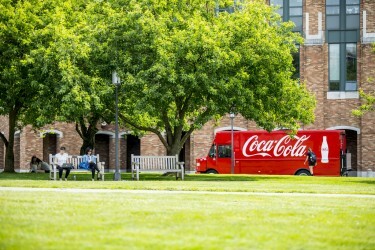 Students and faculty can enjoy Coca-Cola products featured in Housing & Food Services locations across campus, from the UW HUB to Residence Halls to UW Athletics. The University of Washington is proud to build strong relationships with our partners that strengthens our shared vision to serve Washington and the world. Coca-Cola Company and the Coca-Cola Scholars Program.